Are toi all sad that Caroll Spinney retired from playing Big Bird and Oscar? Which video sharing site do toi post your Sesame rue clips? How old were toi when toi started watching sesame street? Which character do toi like the most and why? Did How Now Brown Cow and the Moo Waves have other songs (Besides "Wet Paint" and "Danger (It's no Stranger)")? He was going to spend two weeks with his cousins Rosie and Frank. He Kiss his mother good-bye. Then he got into Uncle Jed’s car. Uncle Jed drove out of the city and into the country. Everyone was happy to see Grover. Aunt Edna made a picnic lunch to welcome Grover. She ran to get her bike. One hot summer jour Ernie had a cool idea. And he ran off to the store. On the way Ernie saw Big Bird and Grover. One jour Ernie and Bert were walking par Mister Hooper’s store. “Look at that!” he said. Ernie pressed his nose to the store window. Inside was a beautiful box of paints. It had lots of colors—even or and silver. Ernie started to run home. Elmo was younger and smaller than all of his Friends on Sesame Street. It was hard for him to keep up with them. Elmo could not run as fast as the others. He could not jump as far as the others. He could not play baseball at all. The bat was bigger than Elmo! One sunny jour Ernie and Bert and Big Bird and Grover went roller skating in the park. Suddenly a cloche, bell rang. It was the ice cream truck. Big Bird liked to play with his friends. their see-saws came down but never went up. One jour Big Bird came accueil from the park par himself. “I am too big to play with my friends,” he sobbed. He was so busy crying he did not see his friend, Snuffle-upagus. One jour Bert was painting. He got out the milk. “Bert! Why did toi poor lait on the floor?” asked Ernie. Ernie ran down Sesame Street. “Bert needs a mop. Do toi have one?” he asked Betty Lou. Today was a big jour for Big Bird. He was going to visit Granny Bird. She lived at the seashore! It was his first trip away from home. Big Bird’s Friends took him to the bus stop. “Good-bye, Big Bird! Have fun! We will miss you,” they said. “I will miss you, too,” he said. Big Bird thought the bus would never get there. “Gee, I hope Granny is waiting for me,” he a dit to himself. At last the bus stopped. Granny Bird waved to Big Bird. Herry Monster liked to skip. and right into the mailman. Herry helped the mailman get up. Then he picked up the letters. Herry dropped his bag and read the letter. It was from Ernie and Bert. Herry skipped down the block. Big Bird was looking for someone to play with. Just then Grover ran out of his house. He had a shiny new truck. rejoindre Gloria Estefan with Big Bird and the Birdketeers with a rewritten version of "123" par Gloria Estefan. a comment was made to the poll: Are toi all sad that Caroll Spinney retired from playing Big Bird and Oscar? a comment was made to the poll: What's your favori song from Sesame rue presents Follow That Bird? 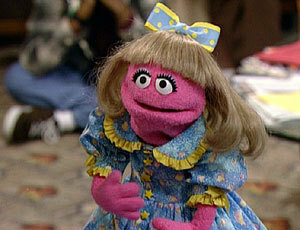 Who is this small, piano-playing character on Sesame Street? Will Twitch do a Sesame rue marathon? Nabisco gets to have an advertising contract with Sesame Street!